Golden State Warriors point guard Stephen Curry admitted to being a little “antsy” in his return to the floor on Saturday night after missing the past 11 games because of a strained left groin. 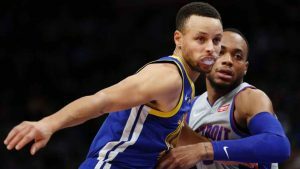 Curry, who had not played since a Nov. 8 loss to the Milwaukee Bucks when he suffered the injury, scored 27 points, grabbed five rebounds, made three assists and had seven turnovers in almost 37 minutes during Saturday’s 111-102 loss to the Detroit Pistons. Curry’s reappearance on the floor was a welcome sight for a Warriors group that has missed his presence on and off the court at times throughout the past few weeks. Curry said his wind was “fine” during the game, but his teammates and coaches understand he’s got some rust he’s still trying to knock off. Thompson added the same thought that his teammates and coaches believe — it won’t take long for Curry to run and gun with his teammates the same way he normally does. The Warriors continue their five-game road trip on Monday night against the Atlanta Hawks. Warriors star Kevin Durant believes his team will play better after having a game to adjust to Curry’s return.